This 9-week, 1-credit hour class meets for 90 minutes per week. 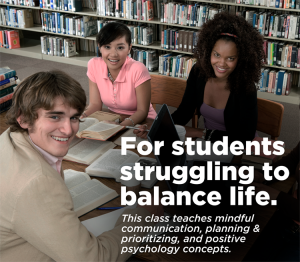 The class includes instruction in mindfulness practices with a special emphasis on how these skills can positively help to manage stress. The class is very practically oriented and teaches breathing strategies, body awareness practices, mindful communication skills, and a variety of positive psychology concepts. This class is only offered for academic credit through MyZou. For more information or for accommodations, email Glenda Pape. Classes are held at the Contemplative Practice Center, Newman Center’s lower level, (map) accessible by stairs only.